My Docs is a single from the British hip-hop/pop-rap act Kiss AMC, released by Syncopate on 22 January 1990. It reached No. 66 in the UK and remained in the charts for two weeks. The song was written by Anderson McConley Hinds and produced by Greg Wilson. Sampling a couple of lines from the Slade Alive! version of "Get Down and Get with It", Noddy Holder appeared in the song's music video. Kiss AMC's sampling of Slade's "Get Down and Get with It" originated with their 1988 single "Let Off", which featured the Ruthless Rap Assassins. After completing the original mix, Kiss AMC's producer Greg Wilson decided to produce a new, remixed version using the "latest sampling techniques". He purchased a bundle of old 7" vinyl singles and one of them was Slade's original 1971 studio version of "Get Down and Get with It". Having been a Slade fan, Wilson experimented with the track and ended up sampling it in the new version. Released in December 1988, "Let Off" was not a commercial success, however Kiss AMC's follow-up, "A Bit of U2" reached No. 58 in the UK in 1989. 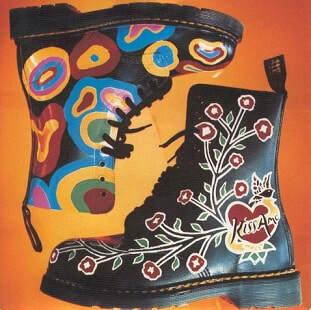 As a follow-up to this single, Kiss AMC recorded "My Docs", a song about Doc Marten boots. As a reference to boots, Wilson chose to again sample "Get Down and Get with It", but this time from the 1972 Slade Alive! version as the vocals were deemed sharper. A number of lines were sampled from the track including "I wanna see everybody get their boots on", "everybody, everywhere", "clap your hands and stamp your feet", "make it, get down and get with it" and "keep on rocking". Released in January 1990, "My Docs" received its debut play on BBC Radio 1's Singled Out on 19 January, with presenter Mike Read commenting how "unmistakable" Holder's vocals were and that "no-one could ever hope to get away with sampling Slade". The single would stall at No. 66 in the UK after airplay on BBC Radio 1 dropped. For the song's music video, Wilson had considered having Holder or all four members of Slade appear in the video. Ultimately, Holder would make an appearance on his own. "My Docs" was released on 7" vinyl, 12" vinyl and CD by Syncopate in the UK and across Europe. The B-side of the 7" vinyl was "Come Again". Two different versions of the 12" vinyl featured different remixes of "My Docs", including the "Two Tone Mix", the "Longsy Dub", the "Amazonian Mix" and the "Dubstrumental". A music video was filmed to promote the single, which featured an appearance from Holder. In late 1989, the editor of the Slade International Fan Club, Malcolm Skellington, had contacted Wilson about the "Let Off" single. During their discussions, Wilson asked if Slade were still around and spoke of his interest in having the band or Holder appear in the video. Holder was soon asked about appearing in the video. He agreed and makes several appearances within the video, performing his lines when they occur. The video ends with Holder and Kiss AMC posing with the Slade salute. "My Docs (Two Tone Mix)"